This programme juxtaposes two works written at either end of the Renaissance era. Robert Carver was Canon of the Chapel Royal in Stirling during the reign of James IV and latterly that of James V, crowned as an infant in 1513. This coronation may well have been the occasion on which Missa Dum sacrum mysterium received its first performance. It is a complex work written for a 10 voice ensemble with sections highly reminiscent of music collected in the Eton Choirbook. Viadana’s Vespers of 1612 offer the familiar sequence of office Psalms and Magnificat. His musical interpretation incorporates much variation in the vocal writing, which is broadly for four choirs throughout. There are echoes of, but no direct imitation of, the 1610 Vespers of Monteverdi – both men were working on these settings at the same time in Mantua. Viadana’s adventurous style enables contrast with instruments and voices throughout the four choirs, introducing opportunities to colour and illustrate the texts most effectively. The singers directed by internationally renowned guest director Andrew Parrott, together with instrumentalists Sue Addison and a team of sackbuts from the Birmingham Conservatoire, Nicholas Perry (playing a variety of early renaissance instruments) and Martin Perkins on organ, are looking forward to bringing this rarely performed music to life – please come to hear us! What a way to beat the weather! In spite of the predictions of very severe conditions of cold wind, snow and ice, director Andrew Parrott arrived just before the blizzard, together with 2/3 of the invited singers to rehearse while snowed-in to Culmstock. More arrived over the next two days (not all, sadly) which decided us to to go ahead with the programme in Wellington on March 4th. The icing on the cake was a very receptive audience – thank you all! 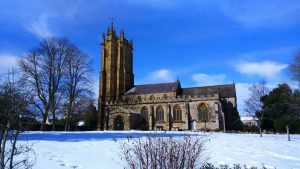 An intrepid group of singers and instrumentalists braved ice, snow and tempest to rehearse over three days and then perform an unusual and fascinating programme of early music in St John’s Church Wellington on 4th March. The first work was the Missa dum Sacrum Mysterium by Scotland’s greatest 16 th -century composer Robert Carver. This is a work probably composed for a great ceremony - of extreme contrapuntal and rhythmic intricacy, with varied textures ranging from full choir in 10 parts to solo duos, trios and other combinations. The singers, under the vigilant and precise direction of Andrew Parrott, rose for the most part successfully to the considerable technical challenges; the relief on many faces at the end spoke volumes. Congratulations to all for recreating a distinctive and intriguing world of sound. Between the sections of the Mass, the amazingly virtuosic Nicholas Perry played secular music of the period on bagpipes, pipe and tabor, and hurdy-gurdy, providing a welcome and entirely appropriate contrast. The second half of the concert was devoted to the 1612 Vespers of Lodovico Grossi da Viadana, who worked at the Cathedral of Mantua while his great contemporary Monteverdi was composer for the Court. While clearly influenced by, and adopting, the emerging Baroque style, Viadana looked back to the 16th -century Venetian practice of combining several choirs (in this case, four) in different parts of the building. Here the singers were joined by the admirable Sue Addison and the Birmingham Conservatoire sackbut ensemble, supported by Martin Perkins on chamber organ. Compared with the Carver Mass, this was music of relative harmonic and rhythmic simplicity, but with impressive tonal opulence which the singers generated with gusto. Perhaps the polychoral antiphonal effects would have been more effective had the choirs been further apart? Between the choral items the sackbuts delighted the audience with sprightly and rhythmical canzonas. 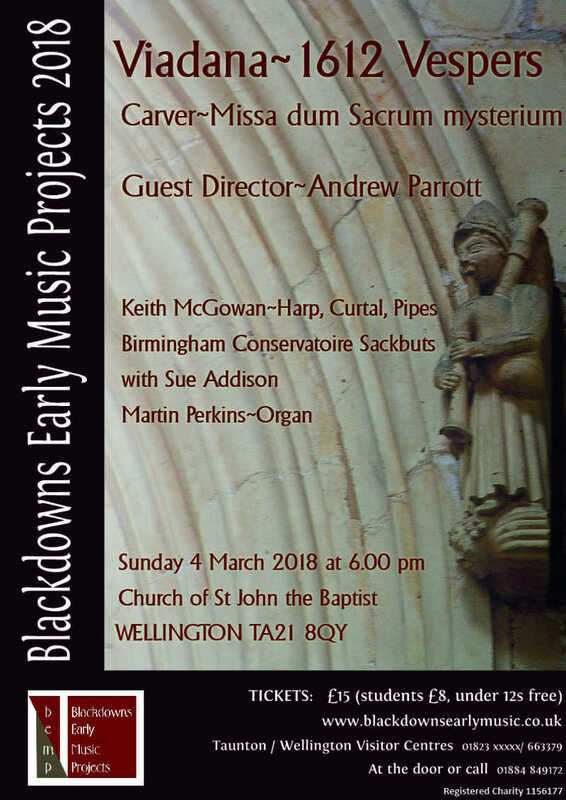 For anyone open to a widening of musical horizons this was a concert to savour, and grateful thanks are due to the organisers of Blackdowns Early Music Projects.